This, is a self portrait. Draw in the style I saw from a 'Blur' poster. (They're a band if you haven't heard of them). 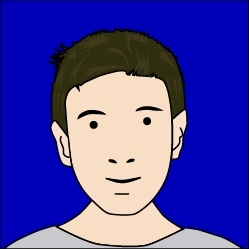 Drawn using the vector based desktop publishing package known as Adobe Illustrator, this is a relatively accurate representation of me. You could argue it looks nothing like me, but well, the jaw is about in the right place, my hair is brown, and I am pale skinned. Need I give more about my appearance or would you like to categorise me further? I drew some other versions of this, an Angry one with a red background, and a Depressed one with a grey background. They are quite effective I think.